Former Ohio State tennis player Blaz Rola hits the ball in a match against Spain’s Pablo Andujar June 23 at Wimbledon in Wimbledon, England. Rola won, 6-3, 6-1, 6-4. As the roar of students on campus fell to a whimper with the Columbus spring turning into summer, the decrescendo was certainly not felt by the many Ohio State athletes who continued their endeavors into the summer months. While some Buckeyes graduated and took the next steps in their individual athletic careers, others competed for championships and still more traveled the world, representing OSU. 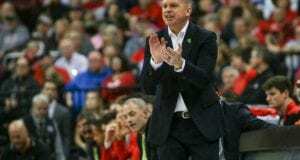 One of the teams that had a busy summer, though their season officially ended in the spring, was the OSU men’s basketball team. The summer began for the men’s basketball team with the announcement that the Buckeyes, along with North Carolina, UCLA and Kentucky, would be part of a new round-robin style basketball tournament called the CBS Sports Classic, which will start this year and happen each year through the 2016 season. 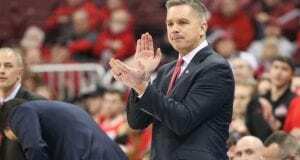 While OSU will face each of the other three teams in subsequent years, it’s set to face North Carolina in its CBS Sports Classic debut at the United Center in Chicago on Dec. 20. While the Buckeyes will likely look forward to that matchup, they spent part of their summers near the warm, sunny beaches of the Bahamas, where they defeated the Bahamas All Stars and the Providence Storm by a combined score of 203-129 in two games. A couple of graduated Buckeye-ballers also kept busy this summer, as two former OSU players found homes in professional basketball. After receiving much praise from Golden State Warriors coach Steve Kerr, former OSU point guard Aaron Craft signed a partially-guaranteed contract with the Warriors and will join the team when training camp begins later this fall. Former Buckeyes forward LaQuinton Ross played with the Los Angeles Lakers’ NBA Summer League team before signing a contract to play for Victoria Libertas in the Lega Basket Serie A. The OSU women’s rowing team took home its second-consecutive NCAA National Championship in Indianapolis this summer. Following the victory, the team became the fourth-winningest program in the country with five NCAA Championships under its belt. As women’s rowing was adding another trophy to its case, the women’s volleyball team was adding an assistant coach. Former California State-San Marcos associate head coach Jay Van Vark was added to the women’s volleyball coaching staff at OSU in early August, bringing with him experience from coaching Team U.S.A. and the U.S.A. Collegiate National team. The Buckeye golf squads were a busy bunch, starting with the resignation of assistant men’s golf coach Ryan Potter after four seasons with OSU. 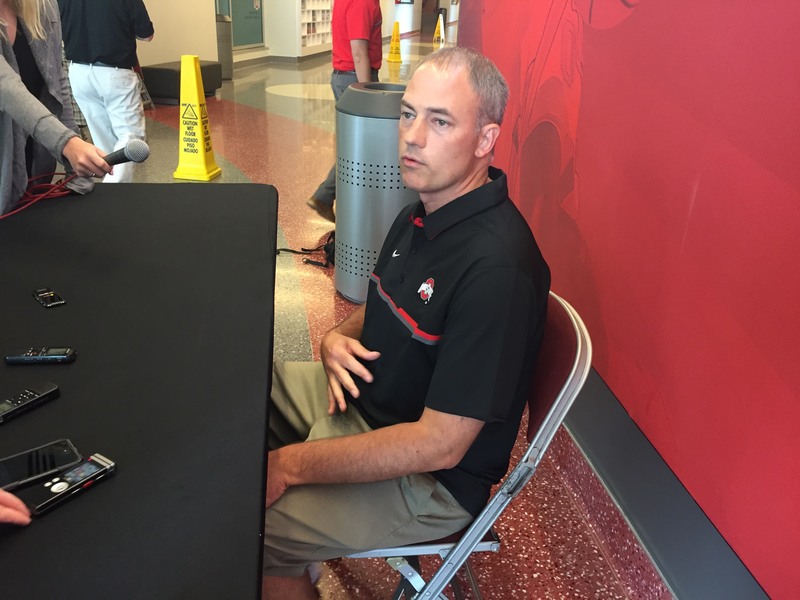 Potter was replaced Saturday, as OSU announced the hiring of J.J. Wood to the same position. Wood most recently coached at Rice University, where he helped lead the Owls to their first ever Conference USA Championship in 2014. The women’s golf team was active this summer as well, but there was one Buckeye who stood out from the rest. Then-freshman golfer Jessica Porvasnik watches her shot at the Lady Buckeye Invitational April 19 in Columbus. 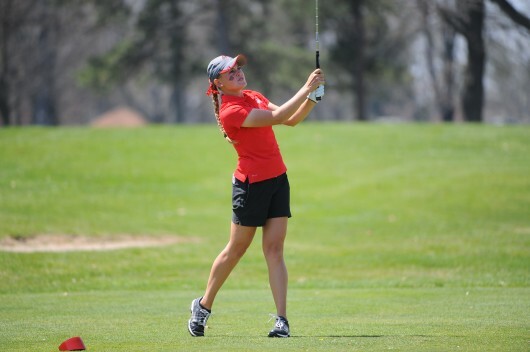 Sophomore Jessica Porvasnik qualified for the 2014 U.S. Women’s Open after shooting back-to-back rounds of 73 at a qualification tournament in Butler, Pa. Porvasnik was one of 25 amateurs and one of 156 total golfers to qualify. Upon her arrival at the U.S. Women’s Open at Pinehurst No. 2 in Pinehurst, N.C., Porvasnik shot a first-round 79 and a second-round 82, leaving her 12 strokes short of the cut to advance to the third round of the tournament. And Porvasnik wasn’t the only Buckeye representing OSU on an international stage this summer. OSU’s first-ever men’s tennis singles NCAA champion Blaz Rola, who accomplished the feat for the Buckeyes in 2013 before turning pro, made his way to Wimbledon for the gentlemen’s singles tournament at the Wimbledon Championships. After defeating the No. 80 Pablo Andujar of Spain in the first round, No. 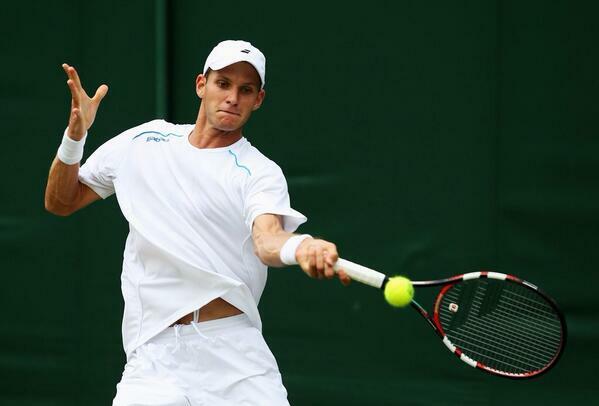 92 Rola, representing Slovenia, was slated to face the defending men’s singles champion and fifth-ranked men’s player in the world, Andy Murray. Murray, who became the first British champion at Wimbledon since 1936 with his victory in 2013, defeated Rola in three sets, 6-1, 6-1, 6-0. As Rola represented the Buckeyes at the All England Club in London, a duo of men’s tennis players — Peter Kobelt and Kevin Metka — were representing OSU at the 2014 NCAA Division I Men’s Doubles Final in Athens, Ga. In what was a back-and-forth affair, Kobelt and Metka fell to Hunter Reese and Mikelis Libietis of the University of Tennessee in three sets, 6-7 (4), 7-6 (3), 6-7 (6). Finally, the track and field teams at OSU kept busy, but more with personnel moves than sprints. 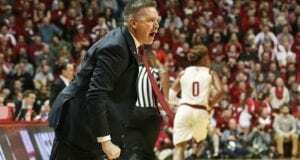 Ed Beathea, the coach of both the OSU men’s track and field and cross country teams, announced his resignation in June to head back to Indiana University, where he spent 10 seasons as an assistant coach and associate head coach to assume the role of the Hoosier’s associate head coach. Beathea’s resignation left a hole that was filled internally, as OSU changed the title of Karen Dennis from the Buckeyes’ women’s track and field and cross country coach to the overall director of track and field and cross country. Dennis previously spent eight seasons as the women’s coach. With the 2014-15 school year beginning and the aforementioned lull on campus roaring back to life, OSU athletics will not ramp back up, but will continue to move as leaves begin to fall.